Christine here. Somehow, even as a child, I knew my parents were not cool. How is it that children suss out these things, before any real experience of the world? My Aunt Mary was cool, and she was even a mother, but my own mother was not. As a mother myself, my own children have clearly figured out that I am not cool: I think they knew it from birth. When I was a child, coolness had something to do with wearing a lot of mascara, having long straight hair, and smoking. It had something to do with doing daring things that were against the rules. The best example of coolness in my neighborhood was my babysitter, Ruthie. She was 13 when I was 8. She had long, long, chestnut brown hair that she would lay her head down on the ironing board to have her sister straighten by ironing it between layers of paper, or else wear in very large curlers bobby-pinned onto her head. She wore baby blue eye shadow. She had 45’s that she would bring over by Bobbie Sherman (Julie, Julie, Julie Do You Love Me) and his ilk to play on my parents’ record player when she was babysitting. She had started wearing a bra and showed me the little lace edging and the “front-loader” hook mechanism (makes it easier for boys to unhook). We would watch “Here Come the Brides” together and sing every word of the theme song. Every time Bobbie Sherman came onto the TV, we would sigh about how gorgeous he was. (I went along with it but always thought David Soul was a little cuter). I was in love with Ruthie. She was gorgeous, she was a princess, she was cool. She was everything I wanted to be. Unfortunately, her own coolness only served to highlight how painfully uncool I was. Ruthie was in the 4th section (out of ten) for her grade at school, and I was in the first. She made it clear that only unattractive eggheads were in section one. She had boyfriends by the dozen, and was always attracted to the next one as soon as she had secured the first. (I was off at college before I would even have my first kiss.) She would “sneak out” at night to hang out and gaze at boys and smoke at the post office/gas station/soda and hoagie ship, which was what passed for a downtown where we lived in rural Pennsylvania. She wore bell-bottoms, and I wore cousin Eileen’s hand-me-downs from 10 years ago, or clothing that Mom sewed me: pretty dresses, but not… cool. In the midst of this great yawning disparity, we had one thing in common: we crocheted. Remember those granny-square vests that everyone wore back then? They were the height of teenage fashion and I longed for one. We would sit on the floor together in front of the TV, yelling at the dog to keep away from the travelling balls of yarn, and crochet the vests that would one day soon make us beautiful and fashionable. This plan worked for Ruthie, the tight little vest outlining her figure. As a 9 or 10 year old at that time, it outlined… nothing. (Still waiting). Ruthie was not the one who taught me how to crochet; my mother did that. But, Ruthie was the one who made it cool and fun. In some respects, I credit her with the spark of passionate interest in all of the creative crafts that I have enjoyed through my life: crochet, knitting, quilting, braiding, embroidery, and sewing. Mom taught me the mechanics, but Ruthie gave me the dream of being fashionable with those crafts. Remember when multiply-patched jeans were the rage? Ruthie had me help her with fancy embroidery stitches at the edges of the patches. I was able to help her, when she was the one who had inspired me! As a kid, I don’t think I was ever so proud of myself as I was at that moment. I still will never be as cool as Ruthie was, and I’m sure she’s completely forgotten me, as we often forget the people around us who are younger and less important. Boyfriends and TV stars filled Ruthie’s head, not neighborhood children with whom she spent the occasional evening babysitting. But I nod my head to Ruthie anyway, and I hope she still gets some satisfaction with crocheting an afghan or knitting a baby sweater for a grandchild, while I obsess about rug braiding. Hit or Miss made of men’s suit jackets and women’s coats, from a few years ago. Christine here. When my husband and I got married, I was 30 and he was 39. Both of our sets of parents were relieved: cousins had teasingly been putting money on my never getting married for years, and my husband thinks his parents were just thankful to find out that he wasn’t gay. Regardless, both were rather uncritical about their future son- and daughter-in-laws. Gone were any thoughts of cultural, emotional, or intellectual compatibility: a warm body was all that was required. There was, nonetheless, some trepidation on both of our parts about meeting the other’s parents before we got married. My parents, who were rather ardently anti-nuclear back in the 1970’s and 80’s when the USA’s and USSR’s nuclear arsenals were at their peak, had marched in several protest marches with the Catholics and the Quakers against nuclear proliferation. Methodists themselves, they joined with some of the religious organizations that thought maybe the ability to destroy all life on earth 200 times was a bit of overkill… maybe just the ability to destroy all life on earth only once would be good enough. My entry for the “Flower Challenge” back in 2010. My future husband was, at that time, gainfully employed in something that he couldn’t talk about at the GE Aerospace facility in Valley Forge. Whatever he was working on behind the security clearance walls, he had to walk through a crowd of anti-nuclear demonstrators every day to go to work. (No, my parents didn’t demonstrate there). So, of course, I had to devil him with what the first Dinner-with-Mom-and-Dad would be like. He didn’t know that my parents would be very circumspect… to heck with concerns about the future of the planet: they were afraid to frighten off anyone who had actually agreed to marry me. My own first meeting with future in-laws was quite different and a bit sad. My husband’s mother, who was only in her 60’s, was beginning to show some early signs of dementia. I met them at their retirement “cottage” in South Carolina and it was exquisite. My mother-in-law was clearly one of those women who enjoyed china and silver and setting a beautiful table and making a gourmet dinner. Everything was lovely, tasteful, and gracious. My future father-in-law was charming and, as a retired general surgeon from Jefferson Hospital in Philadelphia, tried not to choke on his food when I expressed my plan at that time to go into Psychiatry once I finished med school. (He didn’t think much of psychiatrists). But he kept his mouth shut in hopes that his only child might actually reproduce one day. You get the feeling that perhaps both John and I were a little… difficult. I really don’t think either of us were that bad, but somehow things just never worked out with other people. My earlier relationship ended when my former boyfriend’s father didn’t speak to him for 6 months after meeting me, so that he would know what it would be like to be cut off completely from the family (his father was Hindu, and pretty religious). John’s earlier two girlfriends not only broke up with him; they left the state. So… overall, our parents were glad to see us get married and they just weren’t all that picky. One of my favorite rugs: Moss and Mauve, when I experimented with keeping patterns in continuous rugs. When it came to furnishing our first house together, though, we both were old enough that we each had our own dishes, silverware, furniture, and… rugs. My chairs and tables were items handed down from my parents’ attic… probably originally purchased at a yard sale or “antique” store and fixed up. My dishes were purchased at thrift stores and consignment shops and left behind by former roommates. And my rugs were worn but beautiful braided ovals made by my grandmother from my father’s and his siblings’ old clothing. I loved my things. I thought they were beautiful. They were just as precious to me as my husband’s family’s carved mahogany highboy and velvet-cushioned walnut side chairs and oriental rugs and grandfather clock were to him. The only problem was, his items were probably of some actual value and mine were… not. Thus began the inequity in the distribution of family goods. When given a choice between something from his family or something from my family to display in the living room… you guessed it: his family. I understand it: his oriental rugs are truly beautiful. His furniture is, objectively, much better made, often sturdier, and sometimes a real antique. When faced with the decision of where to place furnishings, it wasn’t as if he were dismissing items from my family: it was that I was choosing what looked better, which was always his stuff. But I still like my grandmother’s Victorian sofa with the leg that she got replaced, the little lady’s chair that she needlepointed the seat and back for, and the small pie-crust table that she broke off wooden toothpicks into the base of it to make it level. I like my unmatched silver-plated bowls for Thanksgiving dinner. I like my mom’s china set that she gave me from saving S&H greenstamps. To heck with the accepted valuation of objects: I like my family’s stuff. This slight tension in the perceived “value” of our differing origin-family’s items has been a recurring theme throughout our marriage. So, when my husband brought up wanting to re-do part of the house and rip up the carpeting to give me a place to show off my “beautiful braided rugs,” I was flabbergasted. To follow up on Christine’s last post, ‘California Dreamin’, she is not correct in portraying my fiber room nor house as tidy and organized….but thanks. I finished the braid around the witch which was hooked so well by Kelsie Dore in LA and designed by Tish Murphy. The pix did not come out very well but read on as I have another of the fabrics I used for the braid. I wanted to expand on what Christine said since it was the first time I had been asked to braid around a large hooking. I had of course finished a few braids around small pieces for students when either they couldn’t or time was running out, and I have offered to put braid around a few primitive bookings for my guild friends since I think wide braids would look great (but so far no takers). So it was fun to get the witch in the mail, unroll it and think what might compliment yet not distract from the hooked piece. And doubly fun because Christine was here to help me. 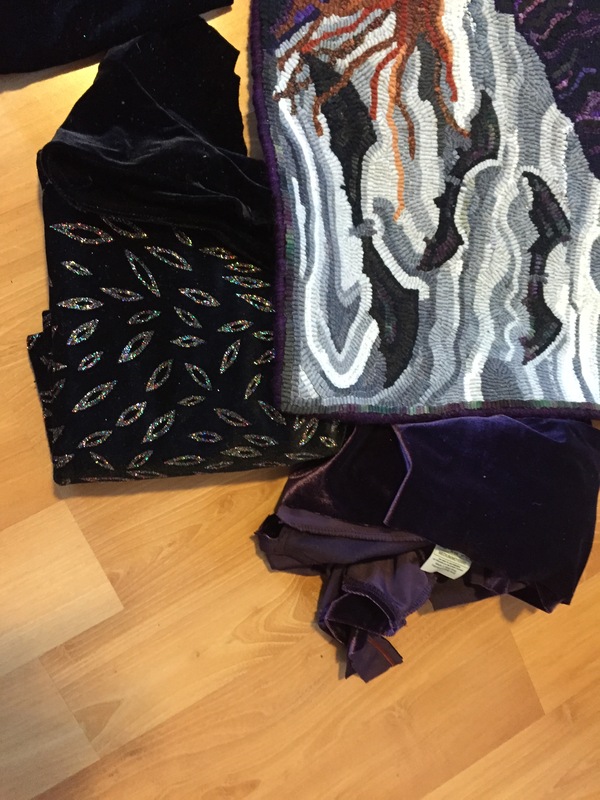 Braiding and hooking friends know I have grown fond of inserting velvet in both as I believe it adds a dimension beyond wool to any piece. 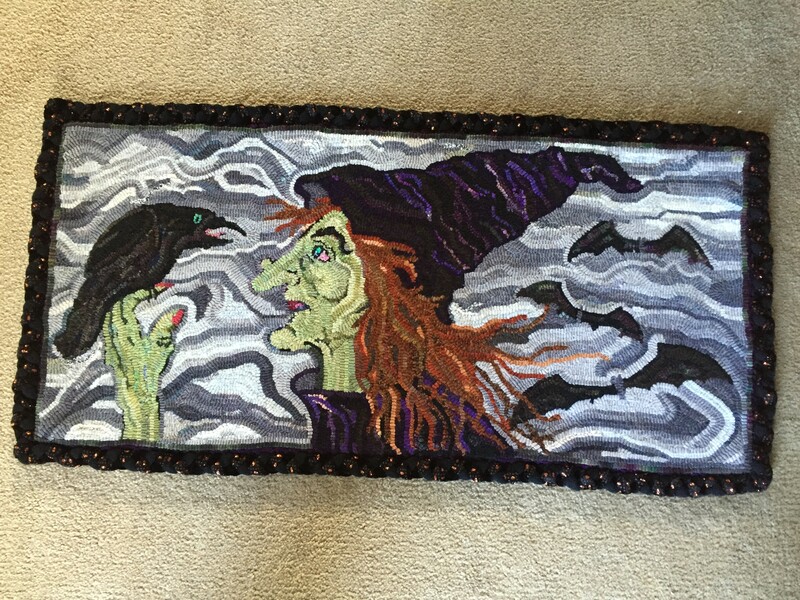 Originally I thought 2 black velvets and one black wool would provide a simple, yet elegant, frame for the witch. The black would pick up black in the background, witch and bats and the velvet would add some interesting texture. 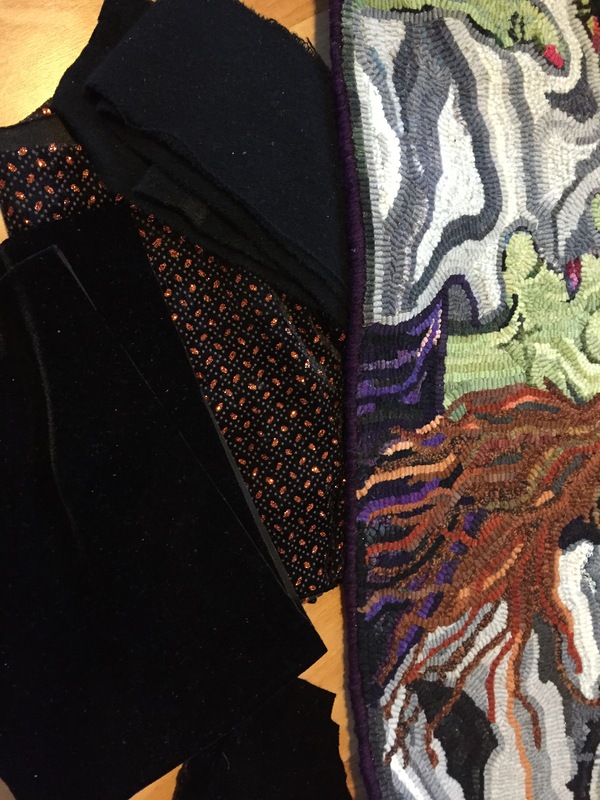 After seeing the vivid colors in the witch’s face, hat and hair we began to explore the velvet bin beyond black. and the orange ‘novelty velvet’ which I paired with black velvet and black wool, which you can see a little better in this pix. I think adding the matte finish strand of wool helps transition the braided frame to the hooking which is all in wool. Kelsie chose the orange and I cut the strips 1.75″ with the orange a little wider because it was much lighter weight. I stuffed it with a piece of waste wool to give it more plump and had to pin the strand when braiding becasue the orange curled up as a strip and wouldn’t lie flat when folding. Grrr! But it worked; did triple corners for the corners tho played with straight braids around the corners which often work well with velvet because it is so soft and I think straight braids soften the corners. Christine here. Other people go out to dinner on Valentine’s Day. Other people stare lovingly into their husband’s eyes while eating a luscious chocolate dessert. Other people listen to romantic songs by Frank Sinatra and Nat King Cole. Other people exchange gifts. There are several problems with taking down the Christmas tree. First and foremost, my husband loves Christmas, turning on the Christmas lights, taking films of the kids opening presents, the confused but excited dogs jumping through the shredded Christmas paper, and the lights on all the houses. He watches videos of Christmases when the kids were younger, looks at all the old Christmas photos from when his parents were still alive, and from when he was just a boy. Then, there’s the sibling parity problem that prevents action on taking down Christmas. If Katie’s away for the weekend or stuck studying for an exam, Jack won’t do any work because he perceives her as having gotten out of work and it’s NOT FAIR. Ditto for Katie regarding Jack. I certainly could take down Christmas by myself – which I would like to do much earlier, because all the decorations hamper my ability to spread out and braid – but I think of the take-down as a Family Activity that we do Together. Marjorie Kauffman’s heart rug made for her daughter. Notice how beautifully she filled in the outer points between hearts. About January 1, I start lobbying for taking things down. My husband says, “Oh, let’s just leave things up awhile longer. The lights are so pretty.” This continues, and continues, and continues. Finally, at some point, I crack. This year, it happened on Valentine’s Day. After yelling at both kids (made worse by my son rolling his eyes at me which usually escalates my volume), we finally got the decorations packed neatly away, the tree disassembled, everything fragile bubble-wrapped, the furniture rearranged, the wreaths discarded, the pine needles swept up, a non-Christmas tablecloth put out on the table, and Christmas boxes packed neatly away on the shelving in the basement. Sigh of relief. After that, I was finally able to restore the dining room table to its original purpose: spreading out a braided rug in progress to work on. And yes, my husband did give me a small box of luscious chocolates, after which I promptly grossed out the children by kissing him in public. And yes, the red bearded cat-talker is still around: from back at college, he skypes with the cats in his Yoda voice. Christine here. I’ve been having a great time visiting Dianne. My family has, of course, been just devastated by my absence (“Can I have the car while you’re gone?”) but they have been bearing up well from what I hear. I flew into San Francisco and met up with Dianne and her husband there. We stayed at a historic hotel and walked all over Chinatown and up to Coit Tower, where there were beautiful murals from the Depression era that had been painted by WPA artists. They took me out to a fascinating sci-fi play called The Nether, and then we came back to their house in Davis. Dianne lives in a beautiful mission-style home in Davis, California and her home is dismayingly NEAT and ORGANIZED. Even her fiber room is sunlit, with a big work-table, and her fabric is laid out on shelves so that you can see everything. Any tool I asked her for, she could locate it in 10 seconds because it was in the exact location it should be. No jumping over piles, lifting up wool, opening up multiple plastic bins, and swearing to find things. Dianne and I have been working in the fiber room. 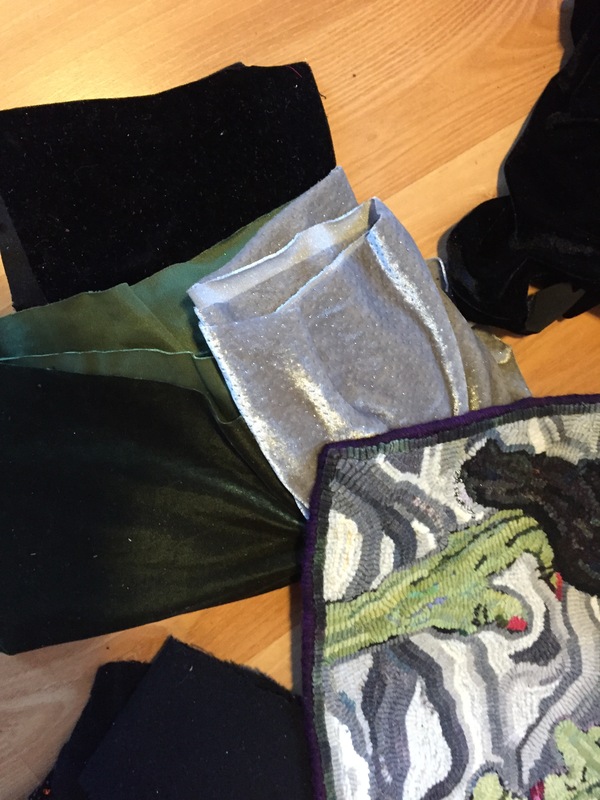 Dianne has been working on a commission piece: she is putting a braid around a rectangle hooked by Kelsie Dore and designed by Tish Murphy; the pattern is called, “Witch’s Consort.” The braid has sparkly velvet, black velvet, and black wool and is looking just perfect. I’ve been working on my maple leaf, but I ran out of wool, so I’ll show the progress on that in another post. Then I am going to teach a class to some local Pittsburgh rug hookers on putting braids around squares and rectangles, so I rug-punched a rectangle so that I’d have something to demonstrate with. I like how the branches, which are hooked vertically, got a bit distorted and kinked by the surrounding loops pushing on them. I tried, at Dianne’s urging, to punch with the stretch velvet, but it just doesn’t look as good as hooked stretch velvet due to the technique – after stretching in the punch downward, when stretch velvet is released from the punch it scrunches up into a little nubbin against the foundation. It looks much better when hooked. I haven’t refined my rug punching technique enough to get all of the loops perfect and even… and sometimes the ¼” strip twists within the punch tool and I get some wonky loops. But, for someone who finds rug hooking tedious (sorry!!) it is a nice quick way to approximate the look. We also did some dyeing. Dianne purchased some stretch velvet and dyed it with a sort of dip-dye method in an electric frying pan. Here’s a photo of the velvet and of a braid with the dyed velvet. We’re having fun! Unfortunately, I have to return to the family today…. Too bad vacation has to end.